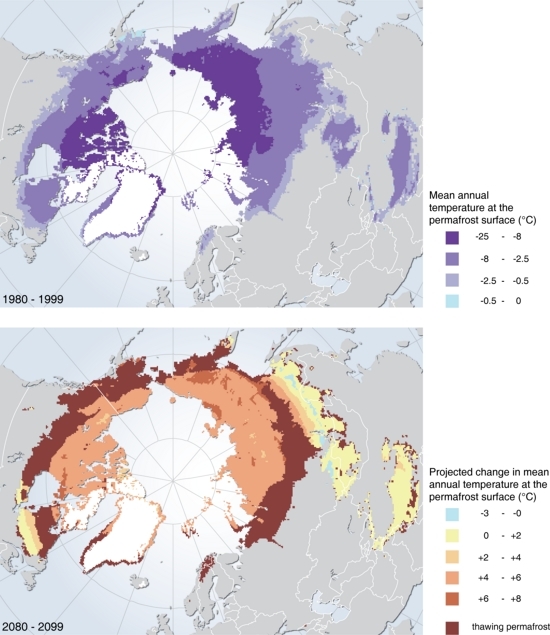 Modelled permafrost temperatures (mean annual temperature at the permafrost surface) for the Northern Hemisphere (Arctic), derived by applying climate conditions to a spatially distributed permafrost model. (a) Present-day: temperatures averaged over the years 1980– 1999. Present-day climatic conditions were based on the CRU2 data set with 0.5° x 0.5° latitude/longitude resolution. (b) Future: projected changes in temperatures in comparison with 1980–1999, averaged over the years 2080–2099. Future climate conditions were derived from the MIT 2D climate model output for the 21st century.